We met in our early College years at the 18th birthday celebration of my blockmate, who was his good friend from High School. He noticed me from way across the opposite side of the room (though he didn’t dare admit it to me, at first), and I was drawn to him when we were introduced (though I didn’t dare admit it to him, initially). It was the typical tale of College love: young, fiery, and spontaneous, sprinkled with a bit of High School drama including the infamous “strict ang parents ko” (from my end, of course), and “MU” (magulong understanding) syndromes. We were never an official item – one reason for our initial relationship’s downfall. We went our separate ways, but our lives remained deeply intertwined – even without us meaning to. Even after he went off to America, the distance seemed to spur our hearts to become closer. He ended the “what if’s” and the “could have been’s” and came back to the Philippines. And on the first night of the Simbang Gabi, standing hand-in-hand before God, I and he finally became we. He was home for Christmas. It’s been three years since his last visit to the Philippines; three years since 16 December 2004, that first day of Simbang Gabi when we finally came to be. Despite the distance, our relationship had grown deeper, and I wanted to express this concretely. On our third anniversary, I had presented him with a time piece (a kind of gift, I later found out, that was often used by modern women to propose to men). He didn’t have a specific gift for me for that particular milestone, which was odd simply because he wasn’t the type to not give a gift. Nonetheless, I wasn’t bothered by it since I felt he had already given me so much. 23 December 2007. The last day of the Simbang Gabi. We spent the day at his parent’s house, playing pool and Nintendo wii with his siblings and cousins. It was by far the most ordinary day we’ve had in the duration of his stay. The final Simbang Gabi was set at eight o’clock. But by seven, we were heading to the community center where the mass was being held. I thought we were unusually early since the center was only five minutes away from their home. When I got down from the car, that’s when I saw it. A beautiful bouquet of flowers sat on a chair atop the stairs going to the entrance of the center. With the warm glow of the Christmas lights strewn around the greenery, it was such a romantic sight. There was also a frame with a collage of our photos and a message stating five reasons why I love him. I was already on the verge of tears, thinking it was such a meaningful anniversary gift that mine paled in comparison. He told me to close my eyes because he had another surprise. 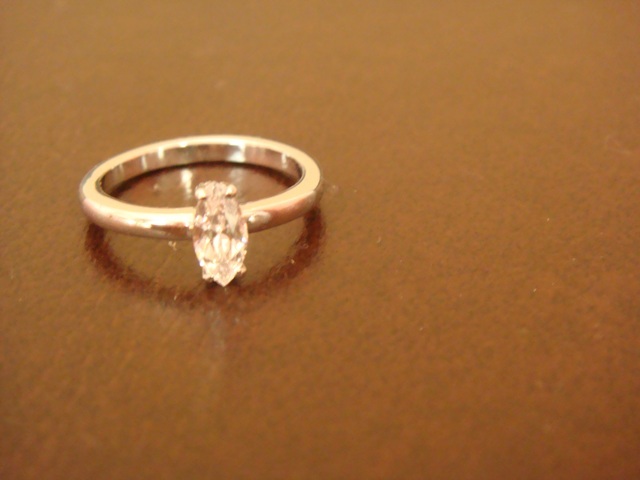 When I turned around and opened my eyes again, he was down on one knee, holding a glistening diamond ring. He asked me to marry him. I’m pretty sure I said yes. I don’t know how many times I did. We must have hugged. I may have kissed him. I hugged his Mom. And I think I hugged his sister. I definitely cried – a lot. I can’t remember his precise words. I can’t remember mine either. But I will be able to relive everything the way it played out exactly, because it was all captured in video by his brother and sister. And so it begins: the story of our storybook wedding. From how he and she became we, to the engagement ring with an unusual marquise. We, with the blessings of our courage and imagination, invite you inside the pages of our journey in wedding planning. Play witness to our decisions made miles apart from one another. RSVP: Read and/or Say-What-You-Wish Via Posting.